Romain Jerome, ever the brand searching for something that no-one else will do, whether this be the Titanic, the moon dust or the Eyjafjallajökull (yes I can say it, it’s my sole party trick) watches, has come up with yet another attention-grabbing model, though in this case, one that is probably far less controversial and with greater broad appeal. 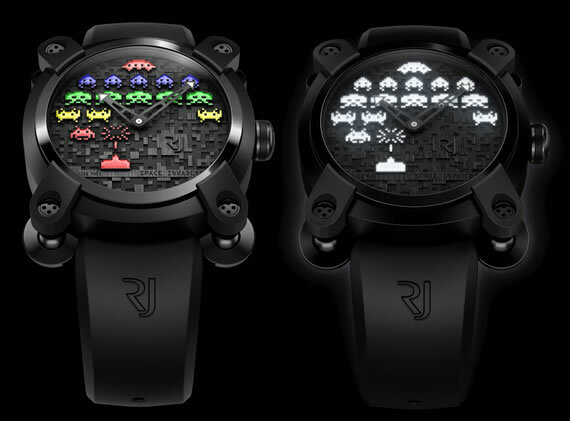 Aimed clearly at the Atari generation, Japan’s TAITO Corporation has agreed to a partnership with Romain Jerome for a two limited edition series of Space Invaders watches. As a member of that generation, and a Space Invaders addict when it was released, this collaboration intrigued me by virtue of it being so unexpected. Then again, with Space Invaders adorning everything from shoes (Vans) to biscuit tins to ice trays nowadays, perhaps it was inevitable that a luxury watch was inevitable. 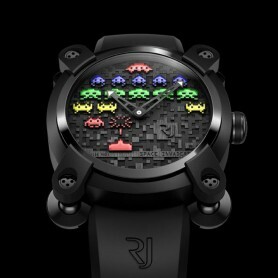 Using their Moon case (not just the shape, but the same case that has the Apollo 11 fragments), Romain Jerome’s two limited edition Space Invaders watches will only have a production run of 78 each, the number chosen to commemorate the year of the game’s birth. The engraved plate on the caseback is made of what they call “Moon SilverRJ”, a silver alloy with an extremely low oxidisation rate, and incorporating moon rocks. The distinctive part of these new watches is of course the dial. It is made of three layers of pixelated and shot peened dies featuring hand-drawn file strokes. Each of the Space Invaders is 3.5 mm, and lacquered in different colours (day version) or coated with Superluminova (night version). 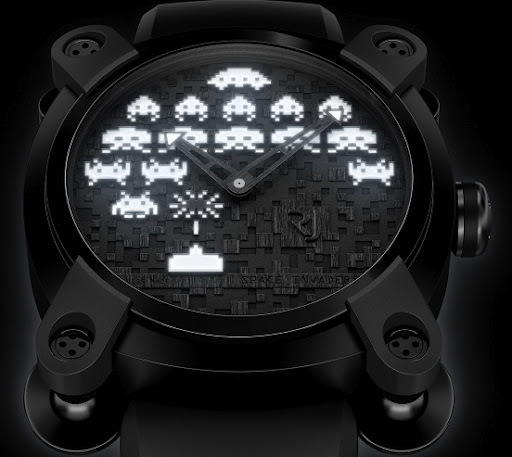 This is a playful watch clearly targeted at the “maturing” Space Invaders addicts who may now be in a position to purchase one of these. However, at a price of $19,500 here in Australia, it remains to be seen as to whether nostalgia will translate into a purchase. Case details : Lugs fitted with safety screws and integrated ball-and-socket joints for wrist adjustment. Dial : Black 3D dial with 3 beadblasted and satin-brushed levels. Pixelated Space Invaders® lacquered in various original colours.